Selected as a member of the NHL’s All-Rookie team after completing his inaugural campaign with the Philadelphia Flyers in 1992-93, Eric Lindros would have a break-out year his sophomore season, scoring an impressive 97 points in just 65 games. 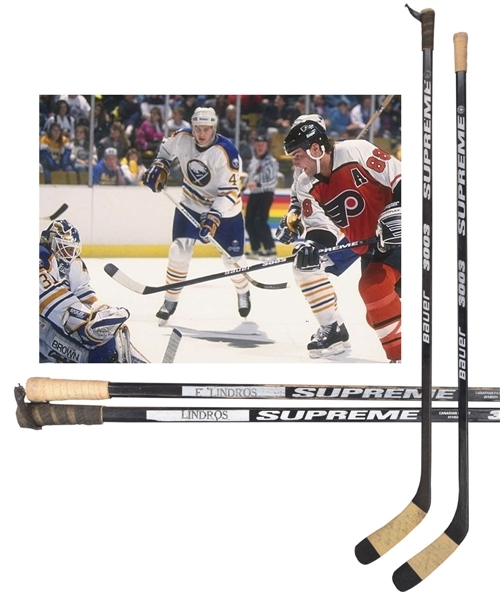 We have a pair of signed sticks used by The Big E during the 1993-94 season. Matching Bauer Supreme 3003 models, “Lindros” appears over the upper shaft of one stick, “E Lindros” the other. Both sticks retain the original white tape over the blade, with matching white cloth tape on one shaved handle, black cloth on the other. Light wear is exhibited on the pair, with one shaft showing heavier use, with each stick signed across the blade by Eric in thin marker, with a personalization added to each. A signed LOA from Eric Lindros will accompany.